Your PayPal Credit account is always at your fingertips. PayPal Credit is accessible from any device 24/7, so you can easily manage your account online or on the PayPal mobile app. Quickly check your balance and make or schedule payments with ease from your PayPal account at any time. Select PayPal Credit one time. Enjoy the benefits every time. Log in to PayPal to set PayPal Credit as your preferred payment method in just a few clicks. Enjoy No Interest if paid in full in 6 months on purchases of $99 or more. Quickly check out when you set PayPal Credit as your preferred way to pay. PayPal Credit is accepted at thousands of stores online where PayPal is accepted. 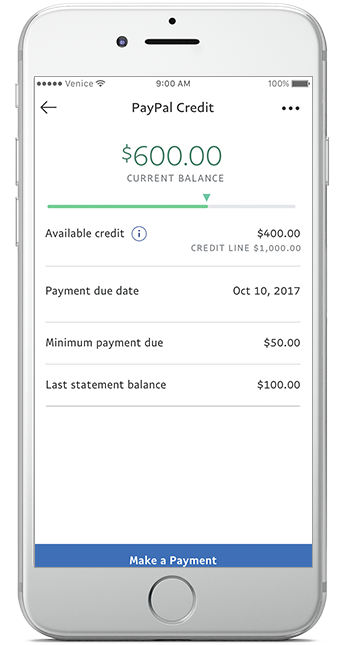 Log in to the PayPal mobile app to check your balance, make and schedule payments, monitor transactions and more. Need to link your account? If your PayPal Credit account is not linked to a PayPal account, you're missing out on all the benefits of PayPal. Linking your accounts is easy and gives you the power to shop where PayPal is accepted, manage your account online and enjoy the convenience and security of PayPal. Already have an account with PayPal?